Stealing from counters is a common complaint, not always limited to large dogs. I’ve known more than a few crafty small dogs who found their way onto the middle of the breakfast table! It’s an annoying habit and potentially expensive if your Sunday roast gets pinched, but it can also be dangerous if Rover steals something that makes him sick or lands on a hot stovetop. With practice and good management, you can put an end to counter surfing. 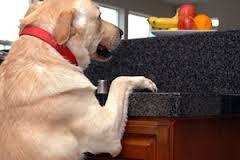 Clear your countertops of temptation until Rover has learned to make better choices. Leaving cream-cheese-laden-bagels, rolls of paper towels and bowls of ball-shaped apples inches from Rover’s nose is just setting him up to fail. Keep in mind that once he ‘scores’ anything from the counter, his surfing habit is well reinforced and it will take more work to convince him that this strategy is no longer worth pursuing so your motivation to prevent such a big score should be fairly high. For those with pint sized bandits, be sure to keep chairs pushed in all the way. An error-free environment can lead to what is referred to in behaviour circles as extinction: if after making repeated-yet-unsuccessful attempts to pilfer something tasty from the counter, it’s likely he will just stop trying. I love to teach dogs to ‘leave it’ but how you define this lesson can make a world of difference. Many people will teach ‘leave it – then take it’ which is counter productive (no pun intended!). Leave it means leave it, period. There is no ‘take it’; any reward should come from you instead. 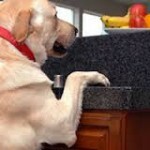 Similarly, timing issues can present problems – if you say Leave It once Rover’s paws are already on the countertop, and then reward him for removing them, you may actually be reinforcing putting them up there in the first place. Spend a few minutes each day ‘baiting’ Rover with tempting items on the counter (or tabletop or coffee table), requesting a Leave It as soon as his nose twitches in that direction. Turning his attention away immediately earns big rewards from you. Over time Rover learns that ignoring temptation is the best choice. You’re preparing a big meal and there is food everywhere. You don’t have time to work on training with Rover. That’s OK; there are some management strategies that can prevent mishaps until you’re ready to work with him again. Confine him away from counters using a crate or a tether or even better: teach him to be content on a bed or mat. Provide him with something even better to do (his favourite chews or my #1 go-to: dinner in a stuffed, frozen Kong). It would be unfair to punish your dog without first working on teaching him the house rules. Have realistic expectations and set your dogs up for success. Instead of spending money on collars that punish with spray or even electric shock, invest in the services of a skilled positive reinforcement based trainer if you need some help.